The Italian and I had no problem choosing this next album as one of our favourites, it’s a bit gorgeous. 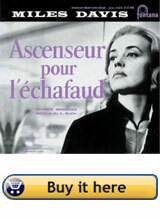 Miles Davis – Ascenseur pour l’échafaud (Lift to the scaffold), the soundtrack to Louis Malle’s film starring Jeanne Moreau, recorded in Paris in 1957. The story goes that Louis Malle had loops made up of sections of the film which ran while Miles and his group watched and improvised whatever came to them. It’s dreamy, haunting stuff. The Italian might be at the stove slowly stirring soup, or custard, and when the final track finishes he’ll say “play it again”. It’s that kind of album, I could sit on the back doorstep shelling peas to it all day long. You can buy it here. When it arrives, put it on, grab a wooden spoon, and stir some soup, you’ll see what we mean. It also goes well with intimate dinners for two, or a glass of wine in front of a roaring log fire. And here’s some soup to stir.